Wow! 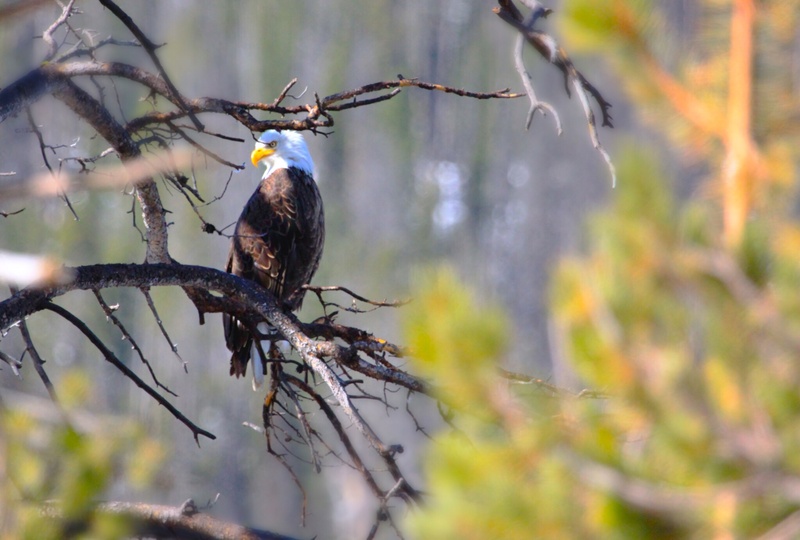 What a day we had today in Yellowstone! We set off across the park to check out reports of a moose which had given birth on a small island, but with recent rains and melting snow having raised river levels, she was struggling to get the calf off the island. 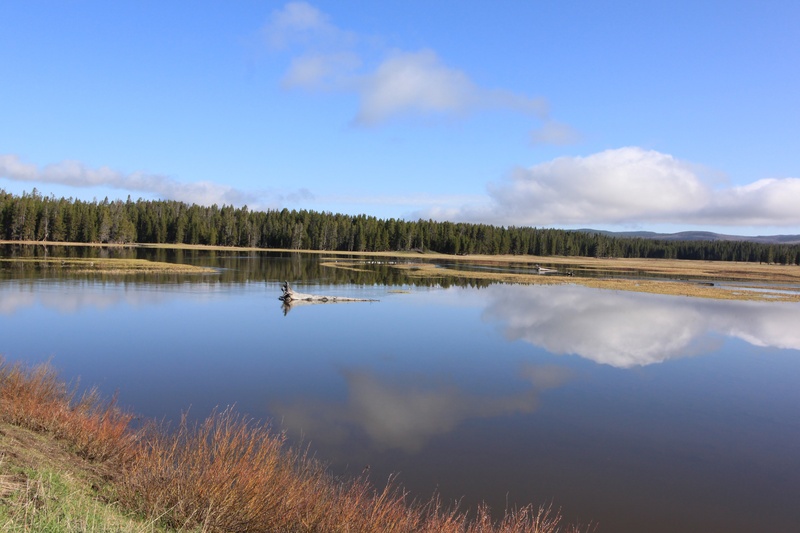 It was a long a beautiful drive past Yellowstone Lake in the higher elevations of the park. 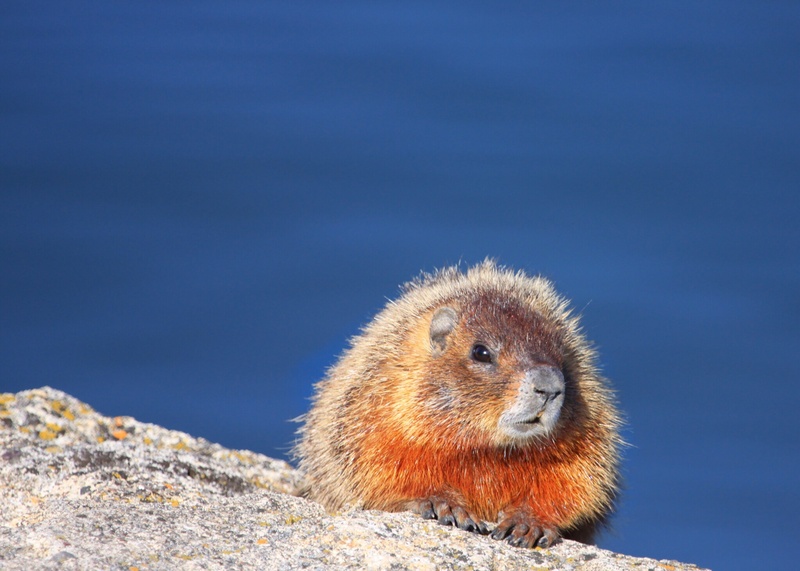 Seeing something small and furry on the edge of the lake, we stopped to find four marmots. Two moved away, but the remaining two put on a show, wrestling with each other right in front of us. 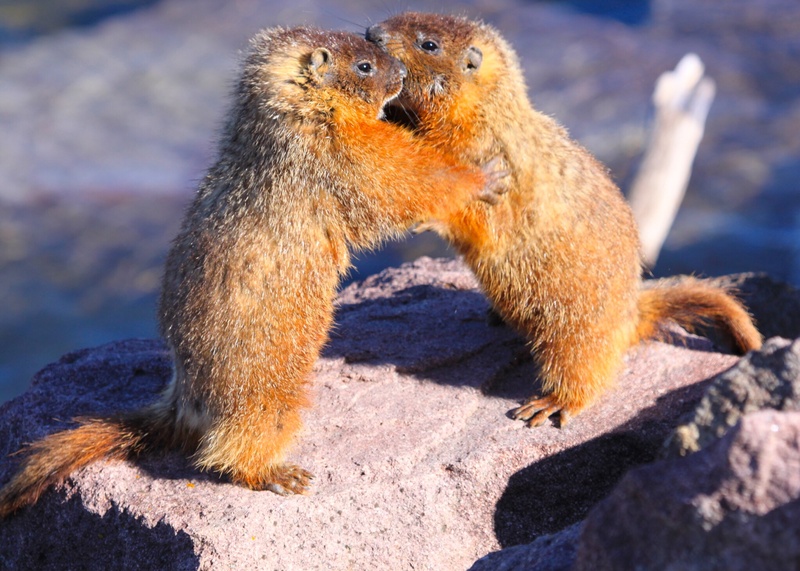 Although they look cute, these little guys have an impressive set of teeth. Further on we stopped so that I could photograph a beautiful bald eagle by the side of a frozen lake. It was nice to see the symbol of the US in such a stunning setting. I could not help but notice, however, that he was not bald at all! 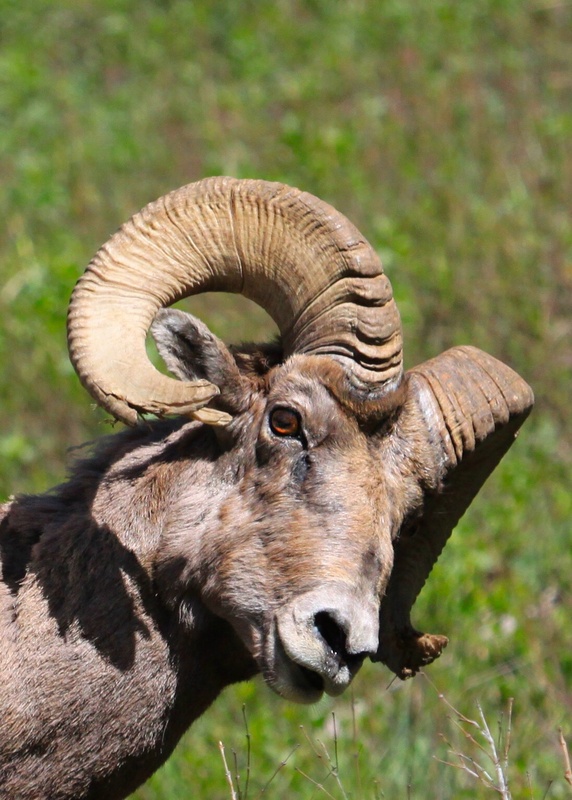 As we started to descend towards the north east entrance to the park, we spotted a group of bighorn rams right by the side of the road. As we had only seen females, we were really pleased to find some males with their impressive horns. Although they were shedding their winter fleece and were therefore a bit scruffy, they are still gorgeous animals. We left the park through the north east entrance to look for the trapped moose. Seeing other photographers by the side of the road, we stopped and set up to wait. The mother moose was lying in some bushes, barely visible. After a few minutes we could see her tiny calf, as he got up and circled his mother. After about a ten minute wait, she got up and fed the baby. Then she led her baby out into the open. To our delight, she began to lead him across the swollen river. He was almost across when the river got deep and the current strong. He began to turn back as the current swept him off his feet and swiftly downstream. It pushed him close to the bank but it was too deep for him to scramble to safety. He was quickly pushed downstream and almost went under. He started to swim, crying piteously while his mother watched helplessly from the bank. Willed on by the dozen or so photographers, the current dragged him towards a sandbank and he was able to regain his footing, and walk back to the island on which he was born. His mother quickly crossed back to join him, tenderly touching his rump as they were reunited. She led him back to the shelter of the bushes to recover from his ordeal. Buzzing from such a thrilling sighting, we had a delicious lunch and set off on the long and scenic drive back towards the north entrance to the park. After about half an hour, we saw a traffic jam that could mean only wolves or bears. Spotting a grizzly and cub moving back towards the direction in which we had come, our guide swung around and parked at a closed service road to wait for the bears. 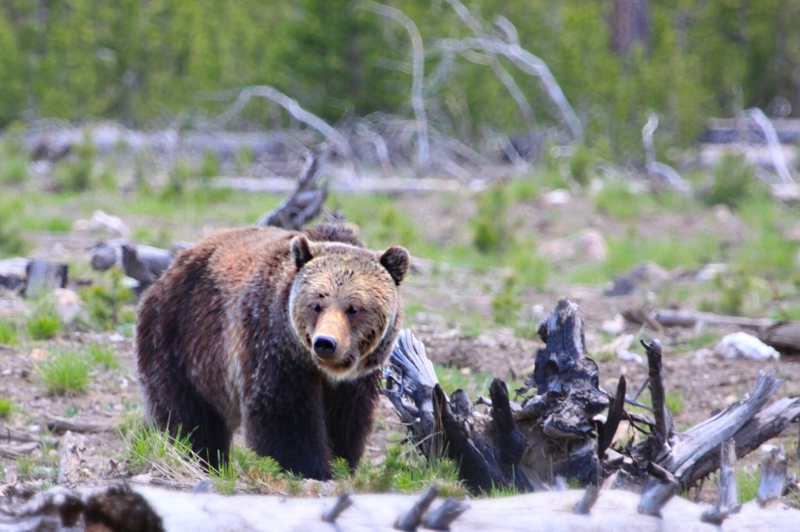 As he pulled his tripod and camera from the boot, he knocked off the bear spray hanging from his belt. Just as the bears appeared walking towards us, a loud hissing signalled escaping pepper spray as the can burst open on the ground. As the bears got closer, we had tears streaming down our faces from the effects of the spray as we tried to get shots. 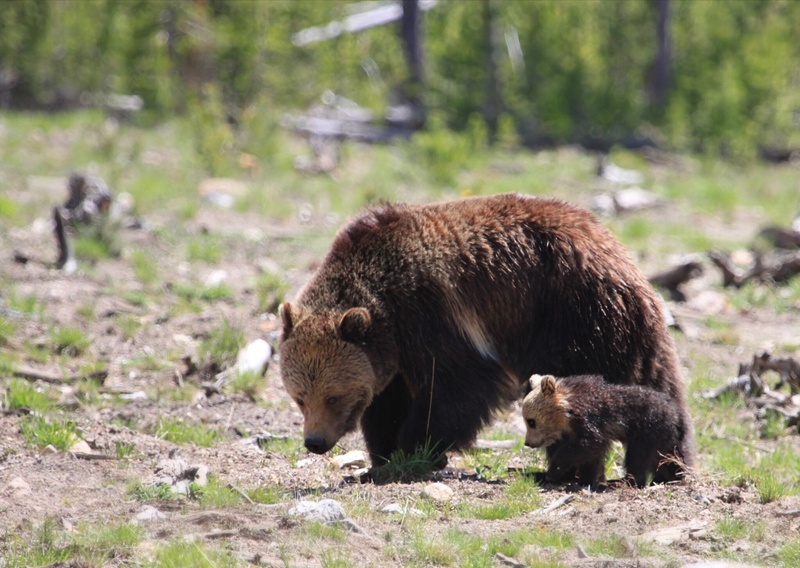 The bears headed straight towards us, but the mother did not even look at us. At one stage they were only about 20 feet from where I was standing, next to the car for a swift evasion manoeuvre if required. Some people walked out towards them, away from the protection of their cars, and no rangers were yet on the scene, which made others watching rather nervous, and one woman yelled at them. Fortunately the bears moved a little further away, and proceeded to forage in the open for more than half an hour. Rangers arrived to stop people from getting too close. 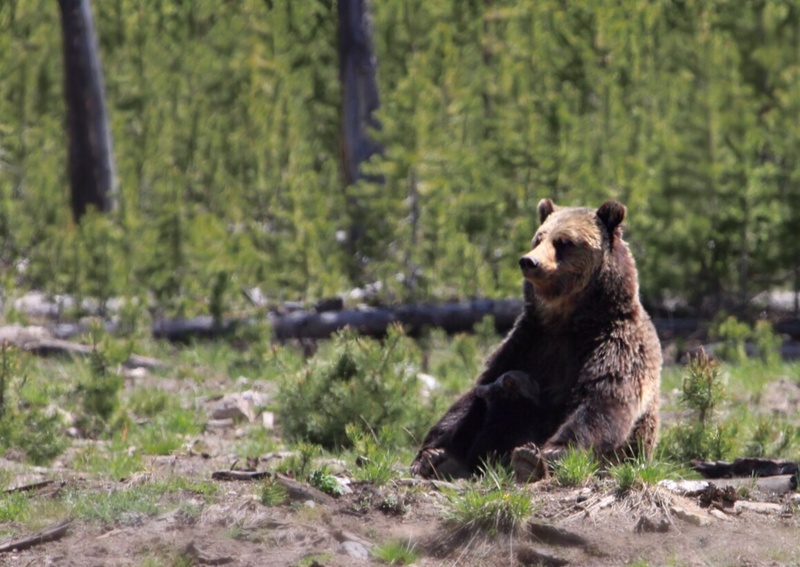 As the bear had moved away from us by the time they arrived, we did not have to relinquish our prime spot. 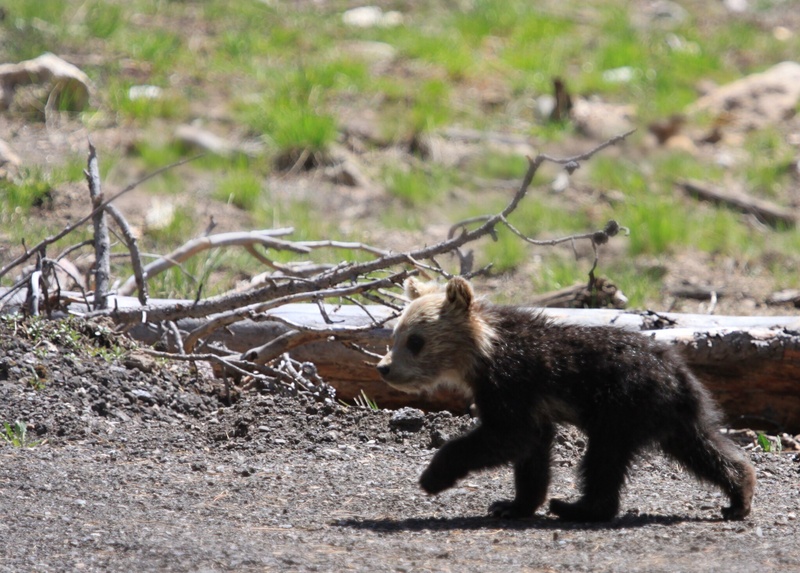 It was warm in the sunshine, probably about 21c, and the baby bear was clearly hot and tired. He kept walking over to his mother and lying in the shade of her massive body, but she was intent on foraging and would move on and leave him lying in the sun. At one point she swatted him away when he tried to suckle. Eventually she relented and sat down to feed him, before rolling on to her back. We got back into the car to continue our journey back. That is when the coughing started. We had to open all the windows and the sunroof to try to get the pepper spray out of the car. Our poor guide had not lived down crashing the car when he filled it with noxious fumes. However, even coughing until I lost my voice (no doubt to the relief of my companions) could not detract from what had been one of the best days of wildlife watching I have ever had. 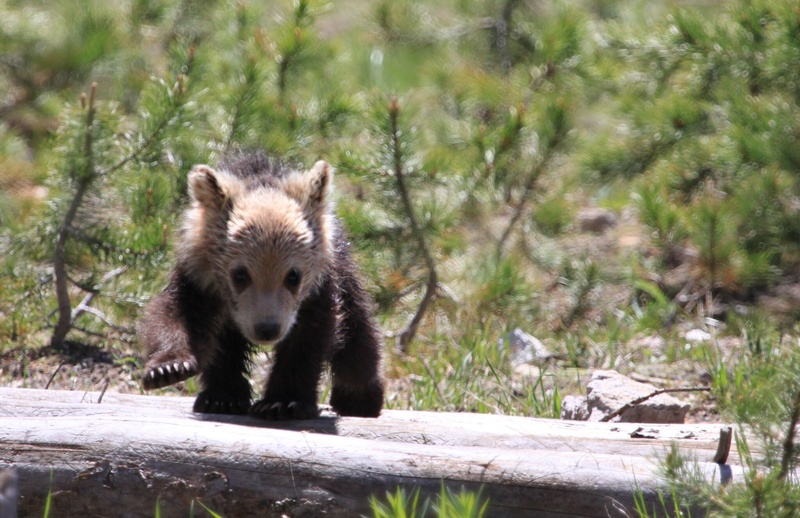 This entry was posted in Yellowstone on 06/06/2014 by paulaclarke.